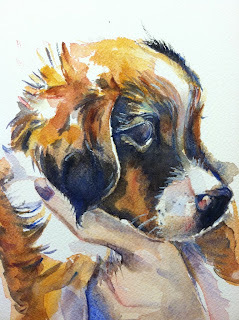 Maria's Watercolor: Watercolor painting puppy "To A Good Home Only"
Watercolor painting puppy "To A Good Home Only"
watercolor painting 8 by 10 inches on Arches watercolor paper, ©Maria T Reichert "To A Good Home Only"
As I learn more in the painting world, I am at times a bit overwhelmed with all I want to accomplish. I find my time stretched too thin, as I dive into pet portraits, people painting, landscape work....so I thought.... maybe if I focus each month on ONE subject....so this month it is dogs! Join in if you like, I may not share all the practice work, after all the focus this month is dog work, not blog work....blog work will be another month! A good idea to focus on one subject! I have a list of paintings I want to do too. This little pup is soooo lovely! 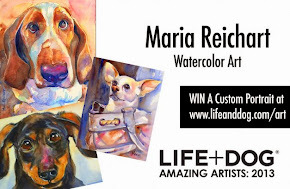 Best wishes for your dog series! Glad you like him Judy. I may run out of dog photos before the month is over! He is so sweet, what a lovely dog -portrait! Thank you Pat and Jane too, glad you like this one. I think the pup was an Australian Shepherd mixed with a Jack Russell, wonder what he will look like when he grows up? Pat what day is your birthday?! Such a wonderful portrait. I love the looseness and you really captured the soft fur. last day in November, Maria. Thanks Atelier, Pat, I suspect this will be a very smart dog when she grows up! Any big celebrations planned for your birthday?